Beginning with a chance encounter with the beautiful Eliza June Watermark and ending, four days and 900 pages later, with the Events of November 17, this is the story of Gurion Maccabee, age ten: a lover, a fighter, a scholar, and a truly spectacular talker. Expelled from three Jewish day-schools for acts of violence and messianic tendencies, Gurion ends up in the Cage, a special lockdown program for the most hopeless cases of Aptakisic Junior High. Separated from his scholarly followers, Gurion becomes a leader of a very different sort, with righteous aims building to a revolution of troubling intensity. The Instructions is an absolutely singular work of fiction by an important new talent. Combining the crackling voice of Philip Roth with the encyclopedic mind of David Foster Wallace, Adam Levin has shaped a world driven equally by moral fervor and slapstick comedya novel that is muscular and exuberant, troubling and empathetic, monumental, breakneck, romantic, and unforgettable. full of death-defying sentences, manic wit, exciting provocations and simple human warmth." Levin has filled his pages with modern Poloniuses, masters of digression, and with moments rich in fact and feeling." A book that moves beyond completely transparent influences to reach its own distinct, new, great height." "This is a life-consuming novel, one that demands to be read feverishly. When it is over, other fiction feels insufficient, the newspaper seems irrelevant. The Instructions has given the literary genre its long deferred conclusion: Indeed, a dayor fourcan serve as a reminder that death looms large for anything living, but there is lot of life to be lived in the interim." 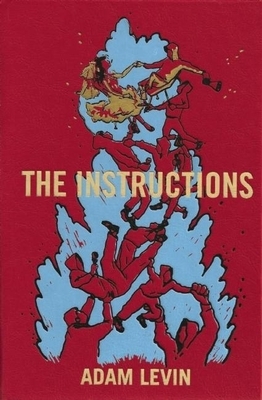 "The Instructions is addictively quotable, violently funny, insanely intelligent and utterly compelling. Levin's debut novel is unlike anything I've ever read, in the best possible way." "One of the 21st century's finest literary creations. From every angle, The Instructions fairly screams 'Great American Novel,' a work of fiction not to be trifled with, an amalgam of a young man's life, thoughts and feelings, culled and stacked and printed to be consumed in miserly dribbles." "After The Instructions challenges, charms and betrays you, it might just seduce your soul. The Instructions is disturbing and romantic and ultimately, heartbreaking, and its questions are not easily parsed, even by Gurion's analytic mind. They are the nagging doubts of our own goodness and faith. But it's worth sticking with this author's debut: This is a wunderkind's master class. An incredible creation of fiction." "Levin’s mammoth, riotous, Talmudic, impossibly excessive yet brilliant, mesmerizing, warmhearted, and hilarious work of chutzpah takes place over four feverish days but encompasses the whole of Israel’s battle for existence and the Jewish quest for home and peace." "The Instructions is in fact a vital work ofno getting around itAmerican Jewish literature because it imagines that the genre is indeed through and asks what can be written in its place." "Manic energy, ambition, erudition, interpolation of documents and sheer bulk." "One of the year's most engrossing novels. His voice will haunt you long after you close the book."